We have learnt how a parser constructs parse trees in the syntax analysis phase. The plain parse-tree constructed in that phase is generally of no use for a compiler, as it does not carry any information of how to evaluate the tree. The productions of context-free grammar, which makes the rules of the language, do not accommodate how to interpret them. The above CFG production has no semantic rule associated with it, and it cannot help in making any sense of the production. Semantics of a language provide meaning to its constructs, like tokens and syntax structure. Semantics help interpret symbols, their types, and their relations with each other. Semantic analysis judges whether the syntax structure constructed in the source program derives any meaning or not. Multiple declaration of variable in a scope. Accessing an out of scope variable. Actual and formal parameter mismatch. Attribute grammar is a special form of context-free grammar where some additional information (attributes) are appended to one or more of its non-terminals in order to provide context-sensitive information. Each attribute has well-defined domain of values, such as integer, float, character, string, and expressions. Attribute grammar is a medium to provide semantics to the context-free grammar and it can help specify the syntax and semantics of a programming language. 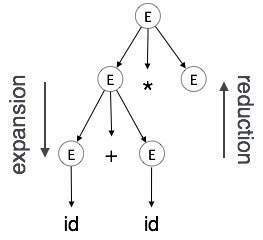 Attribute grammar (when viewed as a parse-tree) can pass values or information among the nodes of a tree. The right part of the CFG contains the semantic rules that specify how the grammar should be interpreted. Here, the values of non-terminals E and T are added together and the result is copied to the non-terminal E.
Semantic attributes may be assigned to their values from their domain at the time of parsing and evaluated at the time of assignment or conditions. Based on the way the attributes get their values, they can be broadly divided into two categories : synthesized attributes and inherited attributes. If S is taking values from its child nodes (A,B,C), then it is said to be a synthesized attribute, as the values of ABC are synthesized to S.
As in our previous example (E → E + T), the parent node E gets its value from its child node. 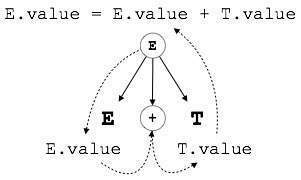 Synthesized attributes never take values from their parent nodes or any sibling nodes. A can get values from S, B and C. B can take values from S, A, and C. Likewise, C can take values from S, A, and B. Reduction : When a terminal is reduced to its corresponding non-terminal according to grammar rules. Syntax trees are parsed top-down and left to right. Whenever reduction occurs, we apply its corresponding semantic rules (actions). Semantic analysis uses Syntax Directed Translations to perform the above tasks. Semantic analyzer receives AST (Abstract Syntax Tree) from its previous stage (syntax analysis). Semantic analyzer attaches attribute information with AST, which are called Attributed AST. For every production, we attach a semantic rule. 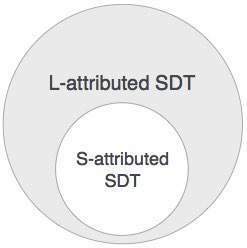 If an SDT uses only synthesized attributes, it is called as S-attributed SDT. These attributes are evaluated using S-attributed SDTs that have their semantic actions written after the production (right hand side). As depicted above, attributes in S-attributed SDTs are evaluated in bottom-up parsing, as the values of the parent nodes depend upon the values of the child nodes. This form of SDT uses both synthesized and inherited attributes with restriction of not taking values from right siblings. S can take values from A, B, and C (synthesized). A can take values from S only. B can take values from S and A. C can get values from S, A, and B. No non-terminal can get values from the sibling to its right. We may conclude that if a definition is S-attributed, then it is also L-attributed as L-attributed definition encloses S-attributed definitions.